Round one of Civil War, as witnessed loosely in Captain America: Civil War, didn’t go particularly well for Marvel’s superheroes. Ten years later, the Avengers lineup has changed in several ways, but there are still plenty of swollen egos to go around, especially when it comes to hotheads like Carol Danvers and Tony Stark. So, naturally, heads are bound to knock from time to time. At the same time, the MU is looking startlingly different itself during Civil War II. After the Terrigen Mists began to circle the globe, new Inhumans sprung up everywhere. Among them, one young man named Ulysses was of specific interest to the mighty Avenger teams. His unique abilities to predict future events sounded like a boon to Captain Marvel. However, after using his foresight to stage a battle, things turned ugly in a hurry. A sneak attack on mad titan Thanos left Captain James Rhodes (War Machine) dead and She-Hulk halfway there. Further predictions caused the death of another long-time card-carrying Avenger, that of Bruce Banner. 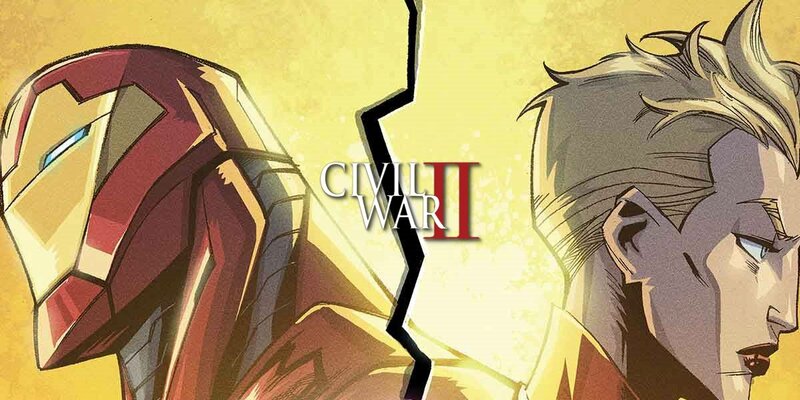 Even after Tony Stark proved that Ulysses' prescient abilities were not quite what they seemed, Carol Danvers insisted on having an opportunity to change the future before it came – which leads us to Civil War II #5. When we last left Tony Stark, he, with the help of Nightcrawler, had spirited away a potentially innocent citizen from Captain Marvel and S.H.I.E.L.D.’s custody. The philosophical struggle between the two reached a breaking point, when Carol headed to the roof to arrest Tony. Unbeknownst to her, Iron Man brought a long a little (read a lot) of help in the form of both Captain Americas, (Jane Foster) Thor, Doctor Strange and the Sorcerers Supreme, Old Man Logan, Vision, Luke Cage, All-New X-Men, and the All New, All Different Avengers, among others. Of course, suspecting brouhaha all along, Carol has a little backup of her own. She’s joined by the Blue Marvel, the Black Panther, Spectrum, Alpha Flight, She-Hulk, and the Extraordinary X-Men and more. As the two teams square off, the fighting seems uneven at first. Despite being outnumbered and a little outgunned, Captain Marvel and her team hold their own until the Guardians of the Galaxy and the Inhumans finally drop by. Once things really get roiling, Civil War II #5 depicts some great action sequences, displaying some of David Marquez, Sean Izaakse and Justin Ponsor's stunning spreads (and vibrant panels). Of course, there's still a little exposition to catch readers up to speed with the characters and the beefs, but there are also a few great zingers – including one of the best meta-sequences of saga so far. Whipping out his “venom blast,” Miles takes down the parasitic superhero suit. In the process, he tosses out a great retort – which also serves as a de facto comeback from the writers: “Another Spider-Man expert telling me how it should be.” It’s an amusing way for Marvel to take a playful swipe at hypercritical fanboys intent on telling them who Spidey can and cannot be. It's also a nice breather before the action literally explodes. Arriving to the party just shy of fashionably late, The Guardians of the Galaxy crew leaps into the fray (with Drax tackling Nova no less), leveling the playing field a little until the Inhumans can arrive en masse. They duke it out with Tony Stark’s team for no more than a few minutes – half an hour, tops – before another death in the family (sort of) occurs. Their assistance has a devastating personal cost, as one of Vision’s Infinity Stone-powered energy blasts nails their ship. As the crew looks on in horror, the Marauder erupts in a ball of fire. The flaming husk spins out of control, crashing straight into the Triskelion. The destruction of their beloved ship, a heartbreaking event under any circumstance, also leaves the space-faring crew stranded on Earth indefinitely (no doubt tying into their upcoming planet-bound adventures). Before anyone else can react to the flaming wreckage or the suddenly shaky ground, Medusa, Karnak, and the Inhumans, along with the Human Torch and Beast, crash the party. However, the most recent Inhuman and cause of all the controversy, Ulysses, is forced to sit out the skirmish on the sidelines. As the Inhumans enter the second Civil War at the request of Captain Marvel, they willfully leave behind their newest member, knowing his sensitivity and his role, albeit incidental, in the downward turn of events. Ulysses is forced to gaze sadly into the horizon, fearing that his newfound abilities could destroy the superheroes he once idolized. His frustration and sorrow only serves to trigger his powers. They quickly begin to manifest again, but this time, something is different. Earlier, Tony Stark discovered that, when the latest Inhuman underwent external stressors, his prophetic abilities would activate. Until recently, Ulysses visions had been limited to his own mind. Later, his hallucinatory states were experienced by those in close proximity. As his latest prediction takes shape, brilliant beams of white light snake from his hands, flowing towards the battlefield. The tendrils wrap around each member of the warring parties and pull the future down around the entire group. While the collected superheroes undergo a hallucinatory state, Ulysses' predictive visualizations push further into the future than ever before. His powers convert the very reality around them into a distant and broken land. The heroes are now surrounded by the rubble of Washington D.C., where Miles Morales stands in smoldering remains of the U.S. Capitol, holding up the impaled form of Captain America (Steve Rogers, that is). Morales is clearly heartbroken by the vision, and crumples to his knees. Ms. Marvel (Kamala Khan) rushes to his side, assuring him “that is not going to happen.” However, the young hero remains unconvinced himself. Shock tenders a temporary truce among the factions, and they watch in disbelief as Captain Marvel places the one-time Ultimate Spider-Man under arrest. Morales' detention leaves a somber tone in its wake. It’s difficult to imagine how the battle can possibly resume at this point. In all likelihood, the war will continue, though, seeing as we're only two-thirds of the way through the series. Of course, the real question is, in light of Steve Rogers' duplicitous nature (which only readers are aware of), will Ulysses' vision cause a new future where Cap and Hydra’s plans come to fruition? Or will the divided Marvel Universe unite and set things right things before things go from bad to worse? Only time, and the remainder of the Civil War II saga, will reveal these answers. Civil War II #5 is currently available online and in stores. Civil War II #6 arrives on October 26, 2016.